Charles W. Kuehne, AHS member since 1962, and past president of the Dayton Chapter, died on June 5, 1989 in Dayton, Ohio. He was 72. 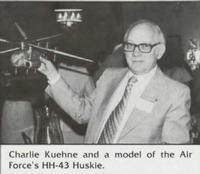 Charlie Kuehne was closely associated with the pioneers of rotary wing flight. As a US Army lieutenant, he began his career in rotary wing aircraft in 1943 at New York University under Dr. Alexander Klemin. In 1944, he received his MS degree in Aeronautical Engineering, specializing in rotary wing aircraft. Upon completion of his active duty as supervisor at Helicopter Mechanics School, Charlie was employed by the Air Force at Wright-Patterson Air Force Base to elp develop Army and Air Force helicopters. He had technical responsibility for direction and overall management of numerous helicopters and V/STOL transport-type aircraft developed since 1946. These included the Kellett XR-8 and XR-10, Firestone XR-9B, Piasecki XH-16, Hughes XH-17, Bell H-40 (UH-1), Vertol CH-47, McDonnell XV-1 compound helicopter, nad Bell XV-3 tilt rotor airplane. Later, in his position as Director of Support Programs and Projects, Charlie was involved in the development of fixed wing aircraft trainers, transports, and liaison types such as the T-38, T-39, C-130, C-140, and L-19. In 1965, Charlie Kuehne was awarded an Honorary Fellowship by the AHS for his outstanding contributioins to the Society and the development of vertical flight aircraft. He was also awarded the Medal of Meritorious Civilian Service by the Department of the Air Force.